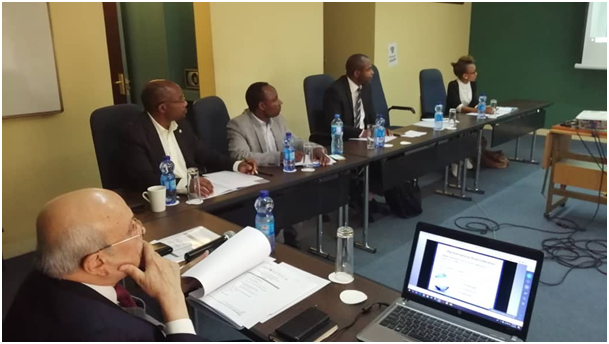 Composed of members from prominent African Institutions, multilateral development banks, key regional and sub-regional Institutions and stakeholders, the IRF Africa Board gathered on 20th February in Addis Ababa, Ethiopia for its second meeting. Chaired by IRF Chairman, Mr Kiran Kapila and coordinated by Mr Joseph Haule, IRF Coordinator in Africa, the meeting had as objectives to: 1. Map key on-going activities in Africa being staged by different stakeholders whether institutional or not 2. Identify priority areas for action 3. Discuss ways to boost coordination and collaboration 4. Agree on some concrete actions to be undertaken in short and medium term. Following an overview of IRF activities in Africa (Data Warehouse, trainings, SaferAfrica, LEARN and SafeRoads Safekids projects) provided by IRF DG, Mrs Susanna Zammataro, members of the board present provided each an update on their institutions’ activities and stressed the importance of connecting to other regional groupings to maximise impact of activities. Asset Management, Road Sector reforms, Fund Boards, Data, Road safety management were some of the issues discussed during the meeting. The need for capacity building at all levels was indeed recognised as a top priority. The IRF Africa Board meets quarterly and operates at a strategic level, primarily performing an advisory role.